On Saturday a month ago, three men left Fish Creek Trailhead near Big Bear, California to hike nine miles to the summit of Mount San Gorgonio Peak the highest point in Southern California at 11,499 feet. They planned on being back at the campground for dinner. 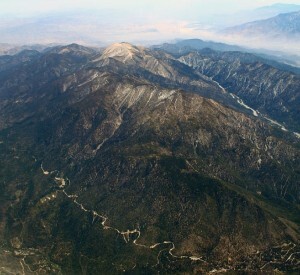 Being about two and half hours east of Los Angeles, the area is home to one of the most heavily used wilderness areas in the country as a tide of city folk moves in every weekend. The Fish Creek Trail, however, is the least-used route up the mountain. The three men were training for a climb up Mount Kilimanjaro this summer. And because, at some point, they decided to leave the trail for who-knows-what reason, they nearly cashed in their chips early. Their day hike turned into three wintry nights at nearly 6,000 feet with no tent, no fire until the third day, and only a few energy bars. Two of the men are from Oceanside, California; the other from nearby Carlsbad. Apparently the three always carry a banner that reads “Jesus is Lord” when they hike. That banner became their blanket for the two nights on the mountain, as they snuggled together under a makeshift shelter of pine boughs and oak branches. On the third day, the clouds parted enough for them to start a fire using a magnifying glass on a Victorinox Swiss Army knife. On Tuesday, a search and rescue helicopter spotted smoke from the men’s fire, which smoked furiously under a heap of green pine boughs. They made it out of the woods, but considering their level of preparation, they were lucky. Although the San Bernardino Mountains get a lot of traffic, failing to have the necessary respect for the terrain—which amounts to preparation, basic knowledge, and telling others where you’ll be—can kill you in California, just like it can kill you in Alaska. The lesson is: Don’t let it happen to you. From June 7 to June 9 Randall’s Adventure & Training (RAT) is hosting an all-women’s survival class near Wrightwood, California, about an hour and 20 minutes northeast of Los Angeles. Instructors Patrick Rollins, Reuben Bolieu and Reza Alla-Bakhshi will cover the basics of woodland survival while camped for two nights on the piney slopes of Angeles National Forest. The Alabama-based RAT is nationally renowned for its survival and bushcraft classes. Its well-heeled cadre of instructors employs a global knowledge of survival techniques that have been tested from Peru to the Philippines to the deserts of Utah. The West Coast branch of RAT has been active for two years and brings the same experience and expertise to wilderness classrooms in California. As RAT’s first all-women’s class, it’s designed as a low-pressure, mostly testosterone-free opportunity to learn and use a variety of bushcraft skills. Much of the material covered will be general principles that can be used nearly anywhere by nearly anyone. Other material will be tailored specifically to women and the items they usually carry. For instance, women are more likely to carry a vanity mirror. So they’ll teach you to use one to signal an aircraft. Dangerous camped with the West Coast branch of RAT in November of 2011 in the same location as the women’s course. (Read the article HERE.) The highlight of that class was stealing a squirrel for dinner from a hawk. With a little salt on it, the squirrel was delicious, and completely devoured within minutes of coming off the fire. May the women be so lucky. Having spent time in the area over the past few years, Rollins, Bolieu and Alla-Bakhshi know the area well and are able to provide a beautiful, rugged classroom well suited to a weekend’s worth of camping. The itinerary includes instruction on shelters, knife safety and use, fire making, navigation, knots, signaling and water purification. For a list of recommended and required gear, visit the Course Descriptions page of the RAT website. The price for the course is $300; June 7 -9. The weather in the area is reliably temperate during May and June. Two employee affiliates of Dangerous are confirmed for the class, and there’s still room to join. Contact Reuben Bolieu (bearthedog76@hotmail.com) or Patrick Rollins (Patrick@jungletraining.com) for more information.